Starting in February when most of the Credit Card Accountability, Responsibility and Disclosure Act reforms go into effect, credit card companies won't be able to increase interest rates on existing fixed-rate accounts unless account holders are more than 60 days late paying their bills. As a result, many card issuers are changing fixed-rate credit card accounts to variable-rate accounts. Variable rates include a fixed amount that's added to an index, such as the prime rate, so variable rates move up and down as the index changes. The switch to variable rates gives credit card issuers greater flexibility and doles out more uncertainty for you. With a variable rate card, your interest rate changes from month to month, and it's likely you will see the rate go up next year after the Federal Reserve ends its efforts to keep interest rates down. 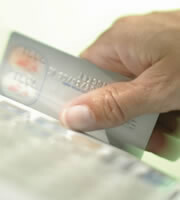 In addition, credit card companies have adopted a practice that the Center for Responsible Lending calls "pick-a-rate." Traditionally, credit card companies tied the rate to the index reported on a certain day of the billing cycle. But more issuers now state the rate will be tied to the maximum index reported in the 90 days preceding the last day of the billing cycle. The practice costs consumers $720 million per year and may reach $2.5 billion per year if it becomes the industry standard, the center concludes in a recent report on industry practices. • Review the terms and conditions on your credit card and the charges on your statement, the Center for Responsible Lending advises. • Pay off your balance each month--or as much of it as possible--to avoid paying interest. • Shop for the best credit card deals and read all the fine print in the contract. Be aware that most credit cards now have variable rates, and that percentage is growing. • Don't charge more than you can afford to pay off in a timely manner. You might be able to pay the minimum due with the current interest rate on a variable-rate credit card, but there's no guarantee you'll be able to afford it once that interest rate goes up. 0 Responses to "The Switch to Variable Credit Card Rates"